Scan, enhance, organize and share almost anything, anytime, anywhere with your iPhone or iPad. Camera’s Auto-mode captures documents quickly and accurately. Enhance scans with a unique set of document imaging tools. Keep documents organized with tags. With seven different export options and multi-select, it’s easy to share, export and manage documents individually or in batch. 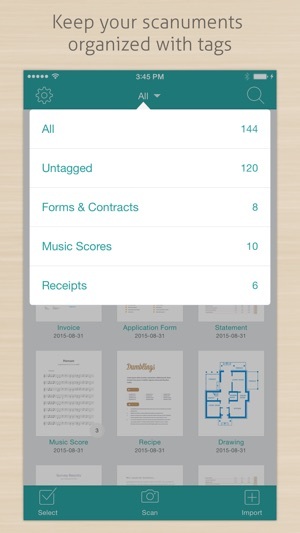 ∙ Scan documents while on the go: Business cards, receipts, forms, contracts, blueprints. ∙ Scan a document to take with you: Travel documents, whiteboards, coupons, barcodes, handwritten notes, music scores. ∙ Scan documents for keep sake: Recipes, magazine articles, newsprint, books, save web pages to PDF and convert html to PDF. ∙ Auto-mode will automatically detect paper, capture the photo and apply perspective correction. ∙ Keep taking photos until all pages are captured. ∙ Turn on Light to eliminate shadows from overhead lighting or for scanning in dim lighting environments. ∙ Use manual mode to manually capture the document or to pause auto paper detection. ∙ Noise and speckles will be automatically removed during scanning and edges will be anti-aliased. ∙ Scanument creates crisp clear scans with smooth fonts that look great on HD displays as well as print. 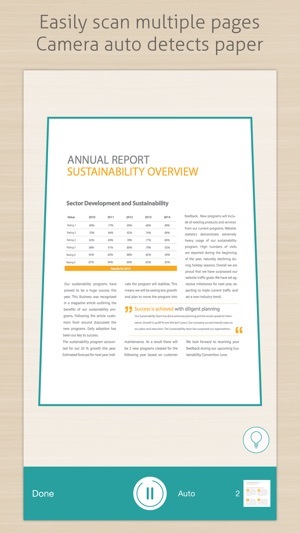 ∙ Export single documents or multi-select to export multiple documents. ∙ Export to Email, Photo Library, Cloud Drive, Air Drop or Print. ∙ Easily send a document to another app using Open in App. ∙ Export to iTunes then retrieve documents using iTunes. Think of tags as categories or folders. ∙ Tag individual scanned document or select multiple documents and add, remove or replace tags. ∙ Filter by a specific tag or untagged documents. ∙ New scans will be automatically tagged for you when a tag filter is selected. ∙ Threshold allows you to adjust the level of detail captured. ∙ Strengthen underlying detail. Try this on handwritten notes, notebook scans, whiteboards or drawings. ∙ Invert tool will convert white text on black background to black text on white background for a printable scanned document. ∙ Switch at anytime between color, gray, black & white or original photo. 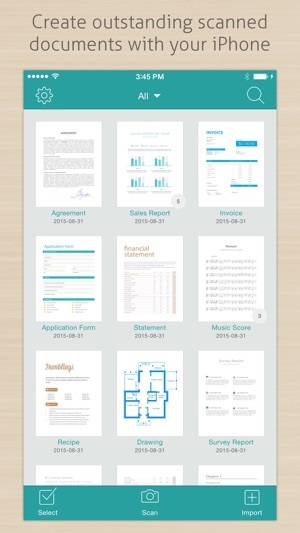 ∙ Color, Gray and Black & White are great for most document types. ∙ Use Text only Color, Gray and Black & White to capture only text in a document. ∙ Use Bold for enhancing scans of handwritten notes, whiteboards or drawings. ∙ Easily compare the scanned image to the original photo or cropped photo. 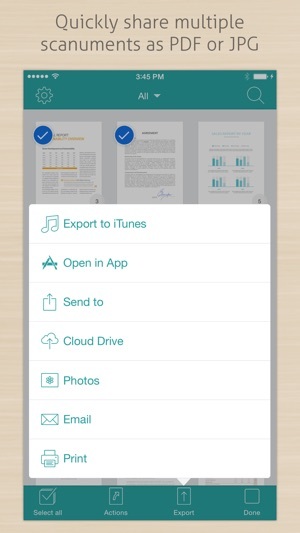 ∙ Take photos of documents from any camera, then import jpg from Cloud Drive or Photo Library. ∙ Print web page to PDF: Copy web url from another app then Import > Paste. ∙ Copy images or text from another app then Import > Paste. ∙ Copy, merge and split documents. 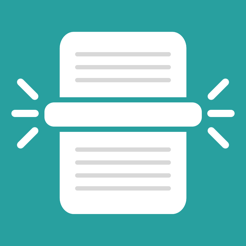 ∙ Re-order pages in a document: press & hold then drag and drop. ∙ Re-scan makes it easy to convert an entire document between scan types or back to the original photo. 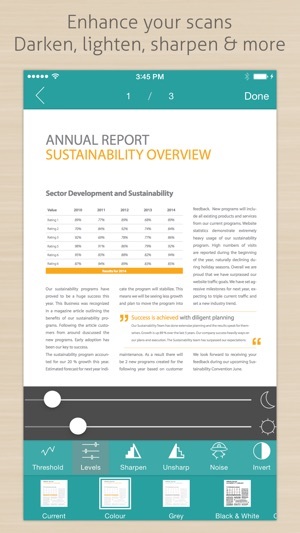 Canvas style cropping allows easy adjustment of margins and layout. ∙ Level: Straighten using single finger drag with grid guides for better accuracy. ∙ Magic: Select a region then apply magic for crop and perspective correction. ∙ Photo: Begin with the original photo then apply the necessary corrections. ∙ Scanument will keep the export history for each document so you can see when and where documents were shared or exported. I was looking for an app that would make it easy to turn notes, books, and sheet music into pdf/digital files to reduce my paper collection. This app does the trick. Using the camera on your phone you can snap photos manually or audio mode and easily create and organize with tags your documents into PDFs. The auto scan wasn’t picking up some of my paper edges but that might be a contrast issue with my background and I just switch it over to manual to snap the shot. Once your are done capturing there images of the document it automatically corrects the photo to be sharp and clear by adjusting the color. I did find that it had a hard time with color illustrations and would automatically wash them out but they do have a way to go and revert it back to the original color photo. It allows you to delete pages easily if you need to retake a photo and reorder your pages. It has a range of options to export your document. I had to use a drive for some because one of my documents had over 100 pages and was too big to email. Thug I e you 5 free exports and then you pay $7 to get rid of watermarks they add. Totally fair price for the time this saves me and glad it isn’t the subscription model. Plus it allows you to use the full app enough to know whether you want to buy it. Great app. It works good or I wouldn't use it enough to be asked so many times to review it that I'm actually reviewing it. Great app. Super easy to use. Love it.